Bald eagles have always been an iconic symbol of strength and leadership. From early Babylon to Native Indians of America, this bird has never wavered in its meaning to all of mankind. Although the bald eagle can live a simple and comfortable life in captivity, this is not their life’s destiny. They grab this duty with gusto and teach us that you must always strive to do your best, no matter your weakness. The bald eagle is the leader over all winged creatures. An example of stamina, power, and freedom, this bird is a symbol that hardships and new beginnings have to be met head-on and conquered. Keeping honesty and truth while battling the woes of the world is tougher than any physical fight. 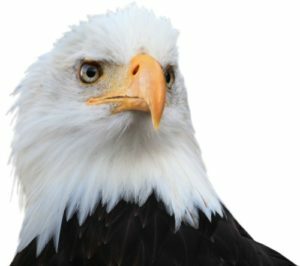 The bald eagle is a mere 12 pounds of hollow bones, but their reputation as being a bold leader far exceeds their mass. 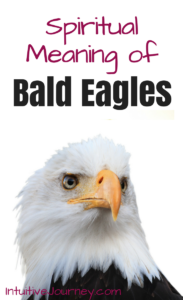 If you spot a bald eagle soaring through the sky, it could be a reminder of your spiritual tasks at hand. Place yourself in the body of the bald eagle and see the world from a new perspective. Power and leadership do not come from being judgmental or arrogant, but by being patient and observant to those around you. The eagle takes it all in and only acts when the time is right. Do not waste energy in worry and performing tasks, but take the steps to merge with your Higher Spirit to improve emotional balance and become enlightened in your desires. The bald eagle reminds us that all things are difficult to manage. In captivity, this bird can live to be 50 years old. However, when allowed to roam bold and free, the life span is cut significantly. This does not affect its ability to know its purpose and to remain the leader of winged creatures. If you are dealing with problems that seem to have no answers, think of the bald eagle and draw your strength from its symbol of hope and power. Speak to your Higher Power to erase all fears and step up to the plate with courage and patience. The lesson of the eagle is to take a look from where it sees. Always work toward expanding your view and finding the right answers to your destiny. If you liked this post, I’d love for you to “PIN IT!